In 1984, an Italian motorcycle manufacturer on the shores of Lake Como began development of a custom Tutto Terreno (All Terrain) motorbike. Dubbed the V65 TT Baja, this one-off Moto Guzzi would be entered into the infamous Paris-Dakar Rally the following year, piloted by Claudio Towers. The bike was a modified version of their V65 TT, Guzzi’s first foray into twin-cylinder dual sport motorcycles. The stock iteration was reasonably well equipped, offering 48 horsepower from a 643cc air-cooled V-twin, disc brakes, a five-speed gearbox and a shaft final drive. It was produced between 1984 and 1987. The Baja, however, featured a custom made 13-gallon fuel tank, a Marzocchi front fork, dual rear shocks, and a solo seat. Only 17 iterations of the Baja were ever built, 15 of which were commissioned by a French importer. Unfortunately, Towers would be forced to retire from the rally due to a battery failure. 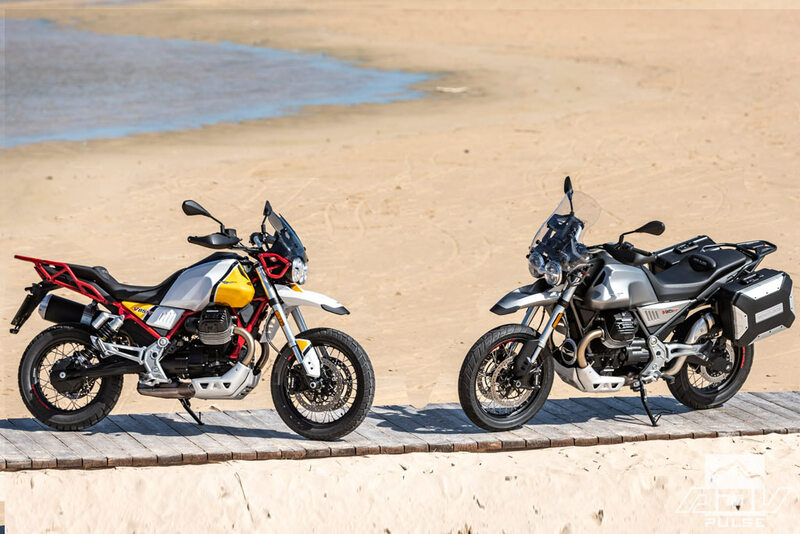 But the legacy of that Dakar entry lives on with the new V85 TT and V85 TT Adventure, Moto Guzzi’s long awaited return to the Tutto Terreno segment. 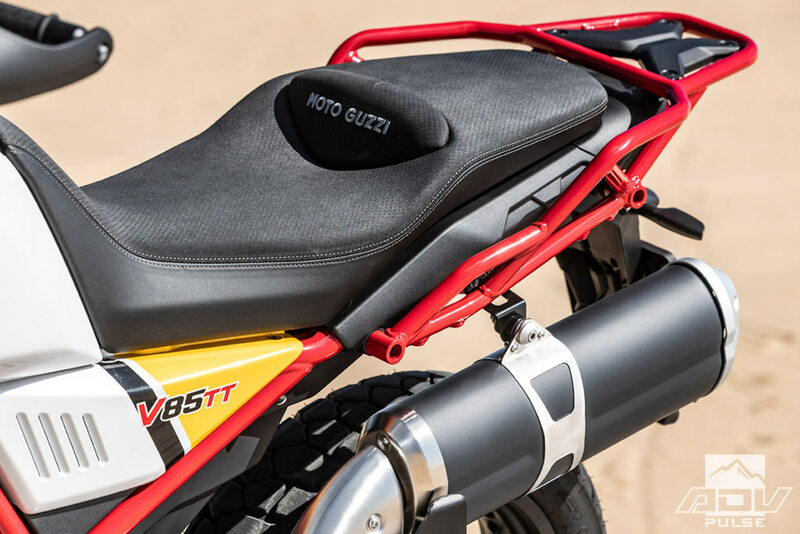 The V85 TT’s color and trim are inspired by the V65 TT Baja – a mid-80’s V-twin enduro Moto Guzzi entered in the Paris-Dakar Rally. Unveiled at EICMA in 2017, the 2020 Moto Guzzi V85 TT is an all-new motorcycle from the Mandello del Lario manufacturer, and the first off-road oriented Guzzi since the departure of the Stelvio. That said, Moto Guzzi does not consider this an adventure motorcycle, nor a scrambler. Instead, they’ve deemed their new TT as a “classic enduro” machine, fitting somewhere between the aforementioned categories. And after closer inspection and a test ride around an Italian island, I think I’d agree. Featuring an all-new 853cc air-cooled 90-degree V-twin motor mounted transversely in the chassis, the V85 TT produces 80 horsepower at 7,750 rpm and 60 lb-ft of torque at 5,000 rpm. To reduce weight and maximize mid-range performance, the new motor utilizes titanium valves and aluminum push rods. 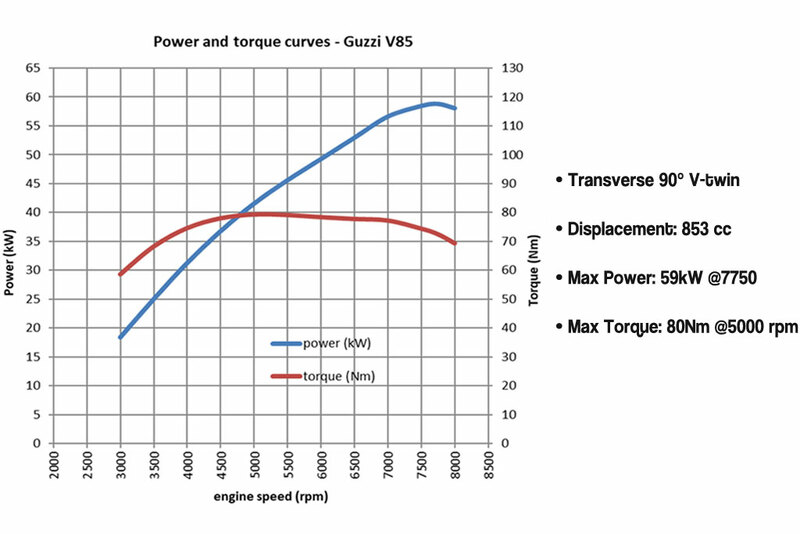 A new low-profile piston and revised crankshaft also aid in the weight savings. The motor offers ample low-end torque, smooth mid-range power and will happily run itself to full song, redlining at roughly 9,000 rpm. The V-twin engine is mated to a six-speed transmission, which transfers power to the rear wheel through a shaft final drive, making the V85 TT the only mid-sized adventure bike to feature a reduced maintenance drivetrain. An 853cc air-cooled, pushrod, 90-degree V-twin motor is designed to deliver gobs of low-end torque and Guzzi character. 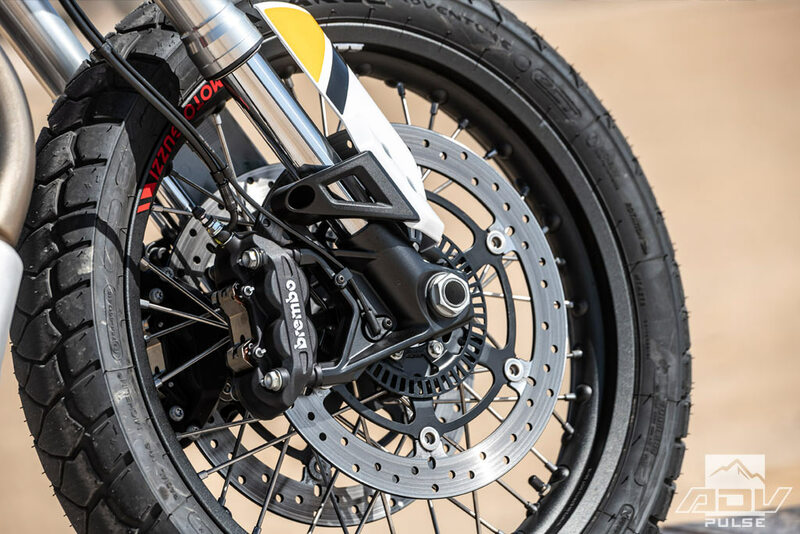 For those looking to lay down big miles on their motorcycle, a shaft drive is advantageous in that it requires considerably less maintenance than a traditional chain-driven bike. And while Guzzi engineers have managed to reduce driveline lash when shifting the V85 TT, I was a bit concerned about the robustness of the final drive enclosure, namely the four bolts that secure the swing arm to the differential housing. The diameter of these bolts seemed inadequate in my opinion, and would therefore be vulnerable to torsional forces applied when riding aggressively off road. That vulnerability, and the exhaust manifold mounted directly beneath the bike, were the only concerns I had regarding the TT’s off road prowess. 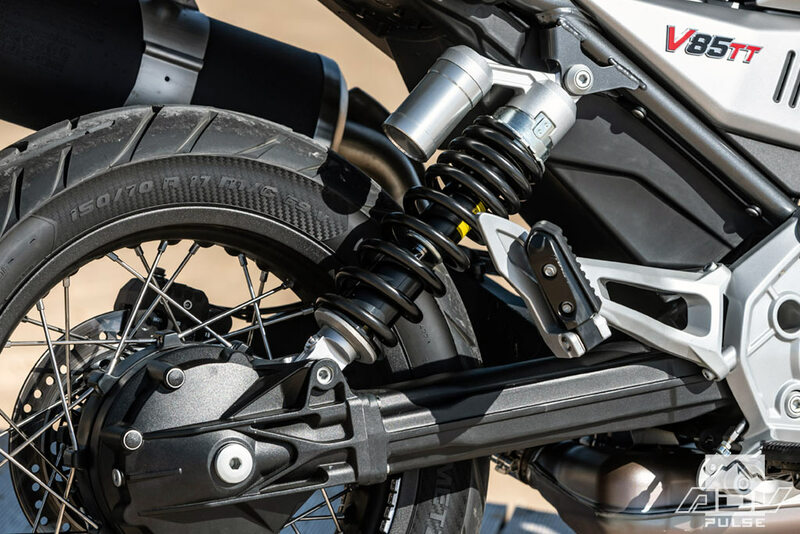 A 41mm inverted KYB fork and a similarly adjustable KYB shock at the rear provide 6.7 inches of suspension travel, and 8.3 inches of ground clearance. Both the front fork and rear shock feature adjustable spring preload and rebound damping. 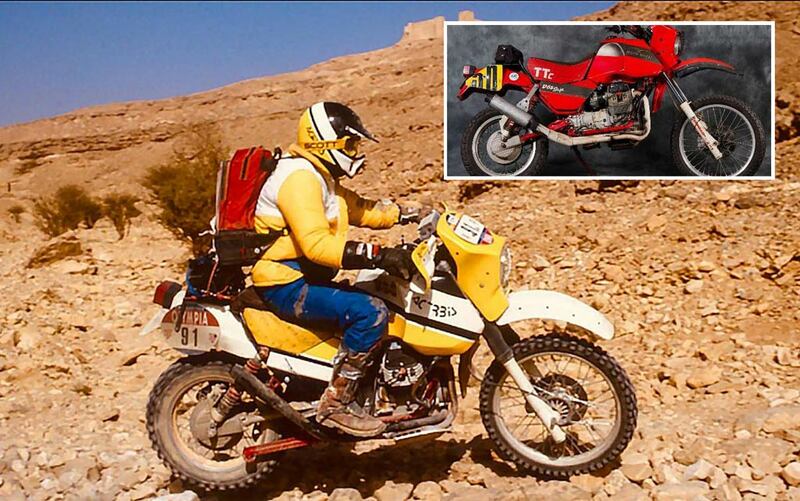 The V85 TT is the only shaft-driven Adventure Bike in the middleweight class. Dual 320mm floating discs with 4-piston, radially-mounted Brembo calipers provide ample stopping power up front. Thankfully, spoked wheels come standard, with a 19-inch front and 17-inch rear wrapped in either Michelin Anakee Adventure tires on the Adventure model, or Metzeler Tourance Next on the standard V85 TT. While both tires are tubeless, the the wire-spoke wheels do require tubes. Alas, you’ll still need a set of tire irons in your tool roll. Stopping power is provided by a pair of 320mm discs squeezed by four-piston Brembo calipers at the front, and a single 260mm floating disc with a two-piston caliper grabbing hold in the rear. A multimap Continental ABS system comes as standard equipment, while Traction Control is provided via ride-by-wire technology and three riding modes – Road, Off-Road, and Rain – each of which adjust engine mapping, ABS, and traction control settings to suit road conditions. In Off-Road mode, for example, additional engine braking is provided, while the ABS is optimized for dirt up front and turned off at the back wheel. Both the standard and adventure model feature a skid plate and full wrap-around hand guards for off-road protection. Similarly, throttle mapping and traction control intervention are adjusted when the bike is switched into Rain mode. That said, you can turn off the ABS and Traction Control entirely by using menu functions on the digital instrument cluster (which features a TFT display, a first for Moto Guzzi), but only when the bike is in Off-Road mode. A fully customizable ride mode is not available, however. 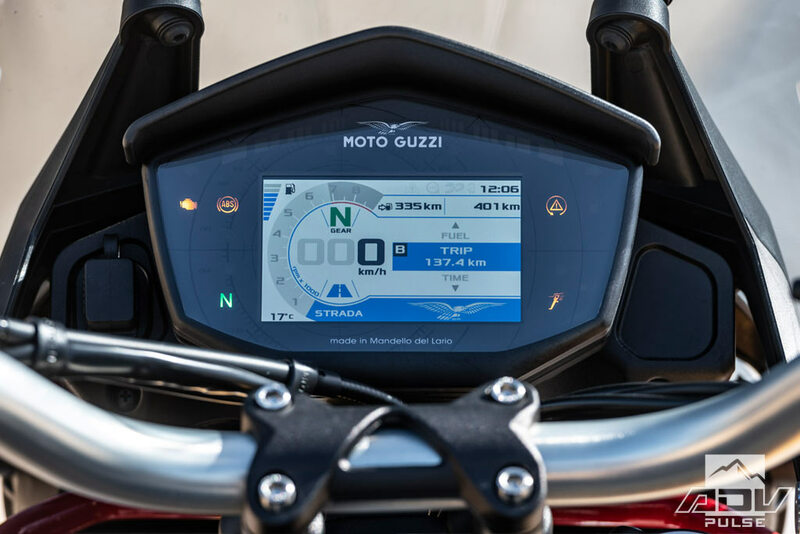 The V85 TT is the first Moto Guzzi to use a Color-TFT display. Controls on the left side operate cruise control, turn signals and horn, while the right side is equipped with a toggle that allows you to move between riding modes. Tipping the scales at 459 lbs dry, and 505 lbs wet, the new V85 TT is nearly 100 lbs lighter than the Stelvio it replaces. Weight loss, as mentioned previously, was achieved not only thanks to lightweight engine components, but also by stiffening the crankcase so it can be used as a stressed member, allowing the trellis frame to no longer require the cradle arms. 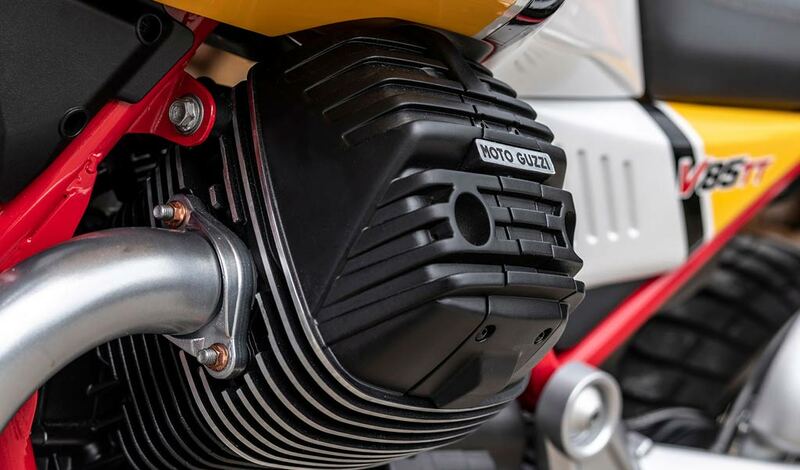 Additionally, the cylinder heads and sump have been trimmed down, which not only reduced the overall weight of the motorcycle, but also aid in rider comfort. 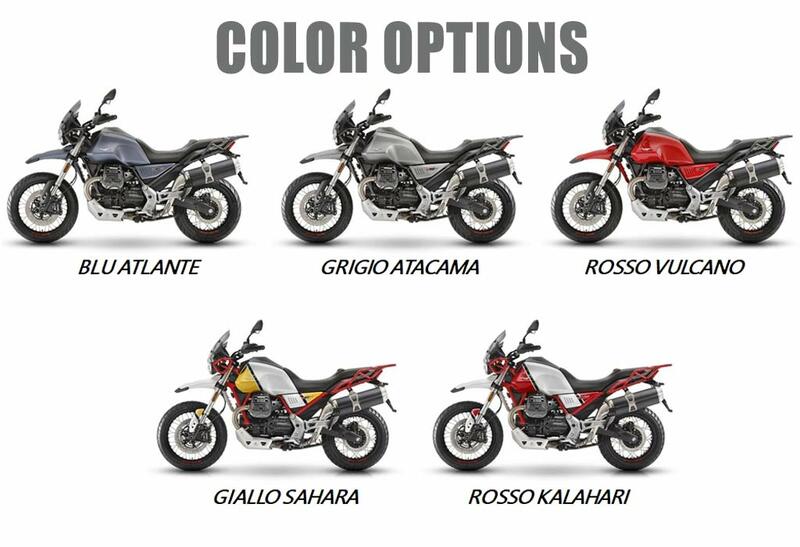 The US gets only 3 of the color options: Giallo Sahara (white/red/yellow), Rosso Kalahari (red/white), and Grigio Atacama (slate grey). All of this is just numbers on paper, though. 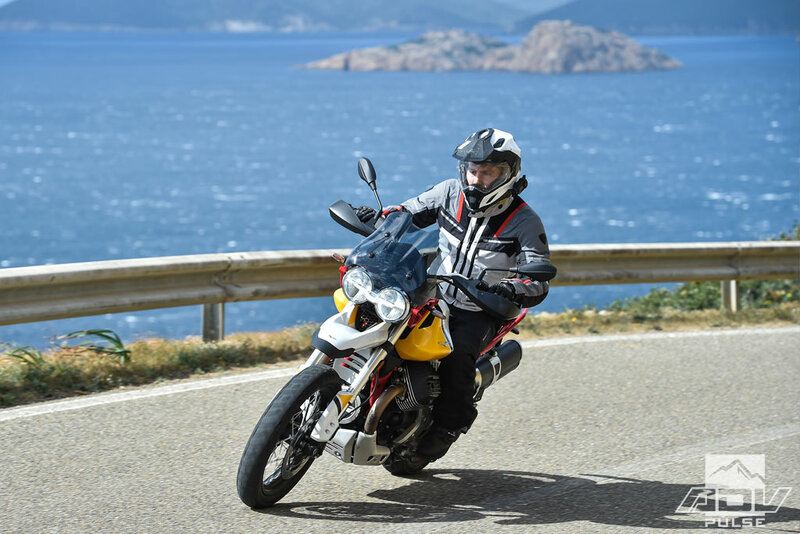 To test the theory, Moto Guzzi invited ADV Pulse to the island of Sardinia, off the coast of Italy to spend a day riding the new V85 TT both on and off road. The exhaust note of the air-cooled, pushrod, 90-degree V-twin makes a bold statement, while the trellis frame and dual headlights offer a classically-inspired look. To say I was skeptical would be a serious understatement. When I first laid eyes on the thing, my initial thoughts centered more on the colorway and long front beak than on how it might perform. 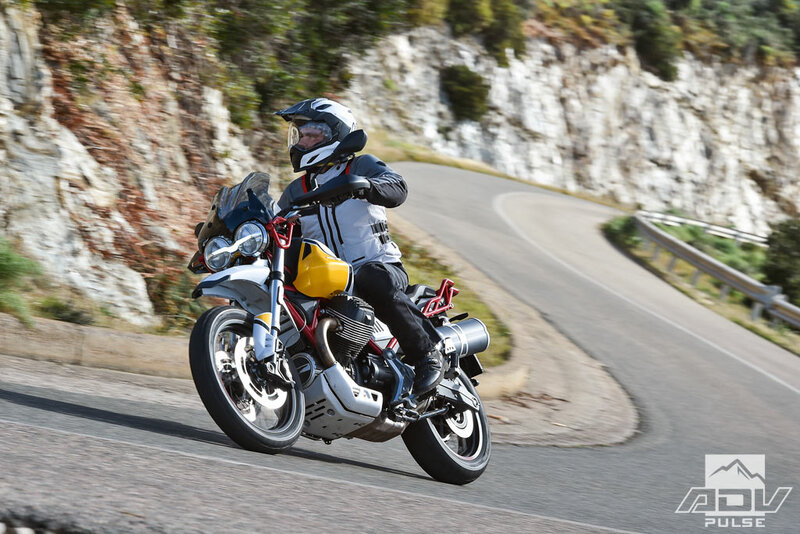 But with a low seat h – 32.5 inches – and optional touring accessories, the new Guzzi seemed like an excellent addition to the ever-growing ADV market, albeit a little weird looking, in my opinion. 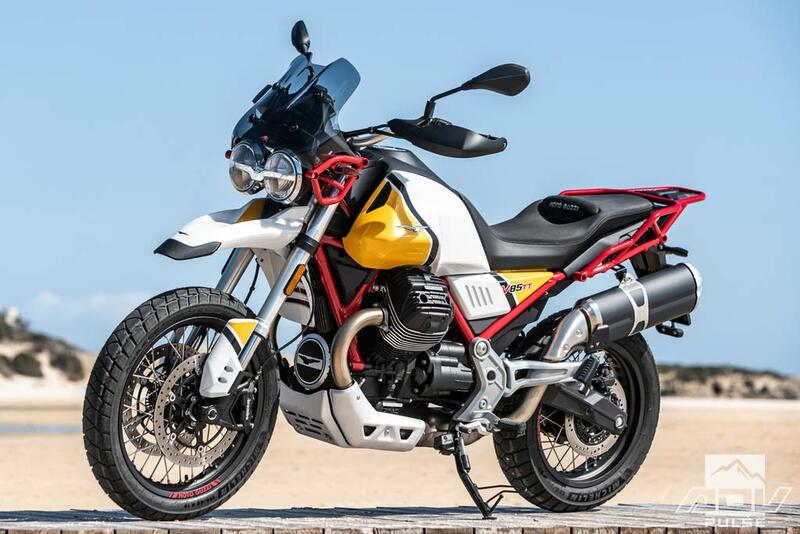 To prove myself wrong I chose the bright white/red/yellow colorway, what Moto Guzzi calls Giallo Sahara and is inspired by their aforementioned entry in the Dakar Rally, then set out for a day ride around the island. When you fire up a Moto Guzzi for the first time, you’ll experience something unlike any other motorcycle on the market. With its transverse engine arrangement, cylinder heads protruding from either side of the bike, it shakes from back-and-forth a bit, reminding you that this isn’t just any motorbike, this is a Moto Guzzi. A throaty sound exits from the 2-into-1 exhaust system, which I am sure would sound substantially better when the OEM unit is replaced with an aftermarket option. Nonetheless, the sound is unique. Different than other V-twin motorcycles. The TFT lights up, and an array of information is displayed to you: engine temp, rpms, riding mode, et al. 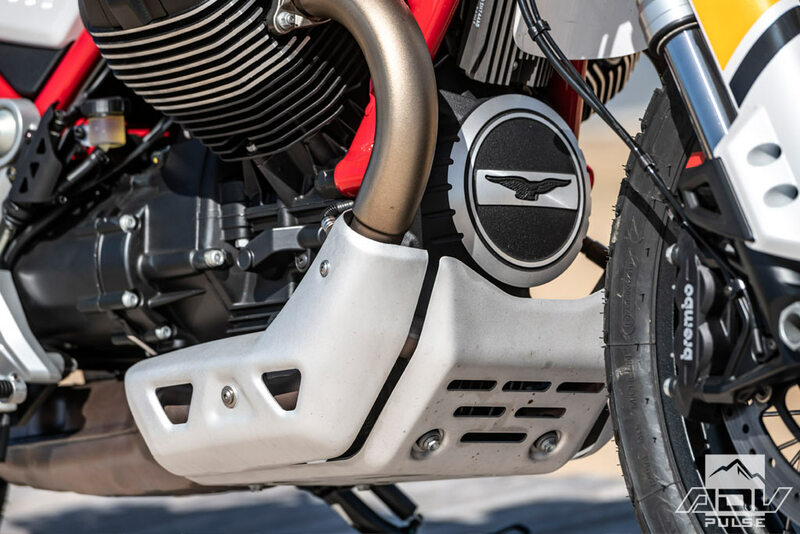 WATCH: Quick close-up look at the Moto Guzzi V85 TT and a sound sample of the 90-degree V-twin powerplant. Overall, the fit and finish of the new TT is classic Moto Guzzi. The air-cooled, pushrod small block V-twin makes a bold statement, while the trellis frame and dual LED headlights offer a classically inspired look melded with modern amenities. The TFT display, for example, is large enough to provide needed information both while seated and standing, showing trip odometer, fuel level, ambient temperature, current and overall fuel consumption, as well as which gear you are in. 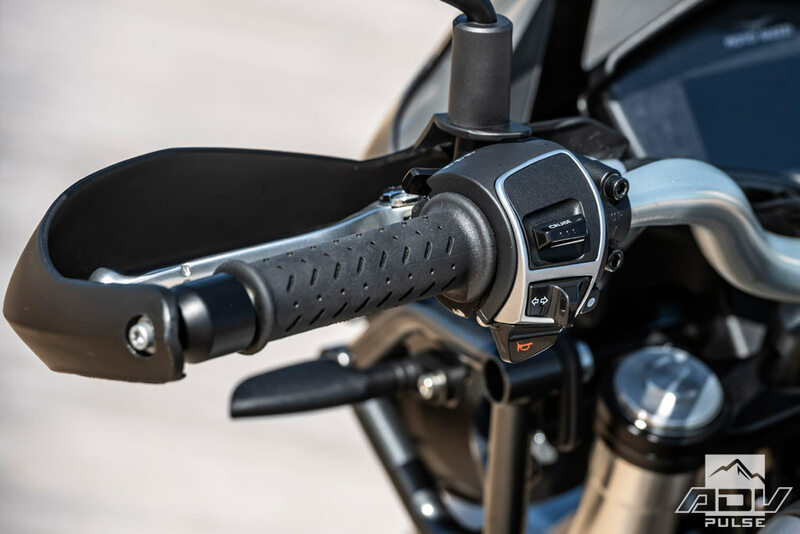 The controls mounted to the handlebar, however, are not as intuitive as those I’ve used on other adventure motorcycles. Controls on the left side operate cruise control, turn signals and your horn, while the right side is equipped with a toggle that allows you to move between riding modes, but only after holding down the power switch until the ride mode flashes on the TFT. Without initial instruction, this would have been difficult to discover. The clutch pull is light with a noticeable friction zone. Thanks to a new single-plate dry clutch, shifting the Guzzi between gears is remarkably smooth, something older iterations are not known for necessarily known for. Our ride leader peeled off down a smooth, paved road and guided us onto a two-lane highway, increasing his speed gradually. By the time we’d clicked into sixth gear and were clipping along at Interstate speeds, I noticed just how useful the small, tinted windscreen was. Now, to be fair, I am only 5’9”, however a taller, touring style screen is available for you gigantic types. 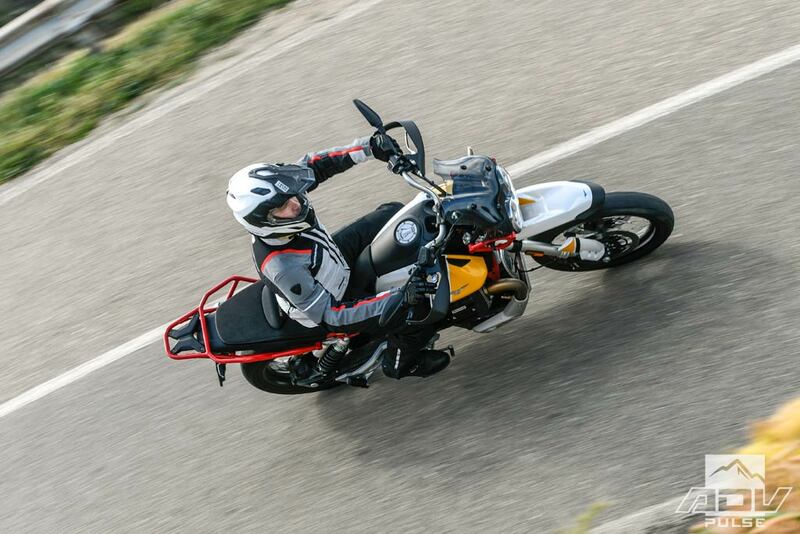 Ergonomics on the V85 TT are akin to many other ADV motorcycles, with a relaxed, upright riding positions. The bars are pulled back just enough to reduce fatigue on your back and shoulders, and yet tall enough that when standing while riding I never found myself leaned over or lurching forward. Again, my standard stature is something to take into consideration. The wide, perforated suede saddle kept my keister comfortable and firmly attached, even when riding the bike at speed along the Sardinian coastline. Power delivery was direct, with my throttle inputs being matched by an appropriate increase in revolutions per minute. Under heavy braking, the new V85 TT was incredibly stable, with the Brembo brakes doing as they’re intended, and the chassis remaining unphased by my abrupt inputs. Turn in was sharp and lean angle substantial, so much so that I found myself scraping the footpeg on both sides of the bike throughout the day. On the pavement, the suspension is more than adequate, with very little compression when applying the brakes hastily. And thanks to a 60.2-inch wheelbase and relaxed 28-degree rake, the V85 TT is balanced and undeniably stable when carrying speed into a corner. 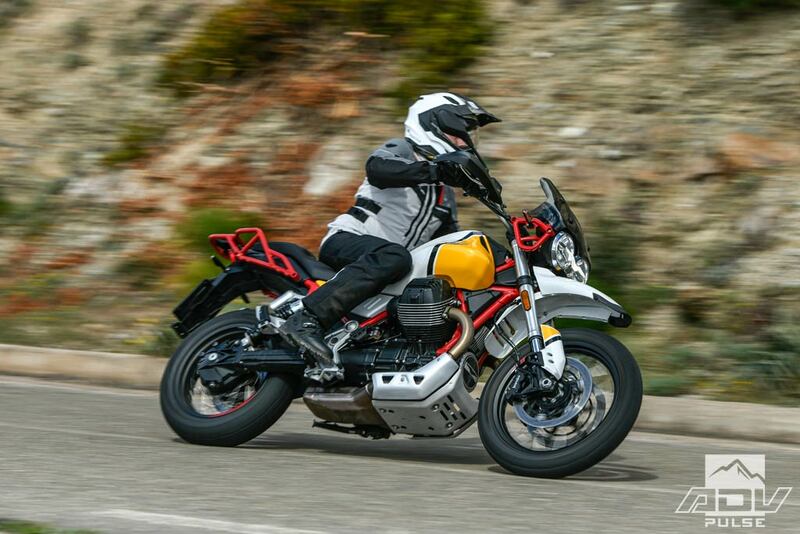 All of this allows the new Guzzi to make quick work of both tight, twisty corners, and long, sweeping mountain roads. The shaft drive transferred power to the rear wheel with ease, producing little to no ‘shaft-jacking’ as I accelerated out of corners, or down a long straight. And while the footpegs scraped in nearly any off-camber corner, this was likely the result of just how stable and confidence inspiring the chassis was. The air-cooled pushrod V-twin produced a substantial amount of low-end torque allowing me to lug the motor out of a corner when I missed a shift. Simultaneously, when clicking through the gears as intended, the 80 horsepower proved more than adequate, often transforming the Guzzi from a mild adventure traveler to a proper sport touring machine. Turn in was sharp and lean angle substantial, so much so that I found myself scraping the footpeg on both sides of the bike. Ergonomics on the road were upright and comfortable. While the V85 TT is equipped with six-gallons of fuel, the tanks is constructed so that it does not interfere with an aggressive riding posture. Similarly, the wide handlebar provided substantial leverage when leaning deep into a corner, and also offered confidence and control when negotiating tight turns or parking lots. Overall, ergonomics for an average sized rider like myself (5’9” and 170-lbs) were unsurprisingly good. When the smooth, paved surface turned to rutted two-track, the Guzzi didn’t seem deterred. I will say that a more appropriate set of off-road tires would likely be my first addition, however the provided Anakees handled everything that was thrown at them. Through loose, baby-head rocks the V85 TT was, again, stable and undeterred. The off-road ergonomics and feel of the V85 TT are similar in many ways to how the bike handles on the pavement. A narrow chassis allows you to squeeze the bike between your knees, providing an increase in control, and the opportunity to shift your weight from peg to peg. The six-gallon fuel tank, again, does not interrupt with aggressive off-pavement riding. The bike is stable and easy to maneuver through technical terrain, thanks in part to a low center of gravity. Ultimately, the TT felt light and nimble through most of the terrain we encountered. When riding more aggressively, however, the suspension felt somewhat inadequate. Stiff, sure, but I found the bottom of both the front and rear suspension when I tagged a 12-inch deep washout at close to 40 mph. In Off-Road mode, the Guzzi’s throttle response was slightly mellowed, allowing for light wheel spin and maximum traction. With the rear ABS deactivated, I could walk the back end through a corner, apply throttle, steer and exit without the worry of overstepping myself. Traction control is your friend, and while some might argue ABS is not, I found myself happy to have it when I grabbed a handful of front brake coming too hot into a turn. Normally, the front end might tuck and that would be the end of my day, and likely my relationship with Moto Guzzi. Instead, though, the braking was modulated, the motorcycle was slowed, and I safely entered and exited the corner. Oh, technology! Throughout the test ride day I found myself a bit bewildered at how well the V85 TT handled. How stable the chassis felt, how well it stopped, and how smooth the gearbox was. This wasn’t the Moto Guzzi I had come to ride. The chugging, clunking, bouncy Italian bike I presumed we would be riding. Instead, I sat atop a modern iteration of a classically themed middle-weight adventure motorcycle, clad in a colorway pulled straight from the company’s long history, with a motor unmistakably Moto Guzzi. And I liked it a lot. The suspension may be slightly inadequate for the kind of off-road riding I might do with a mid-sized adventure bike. 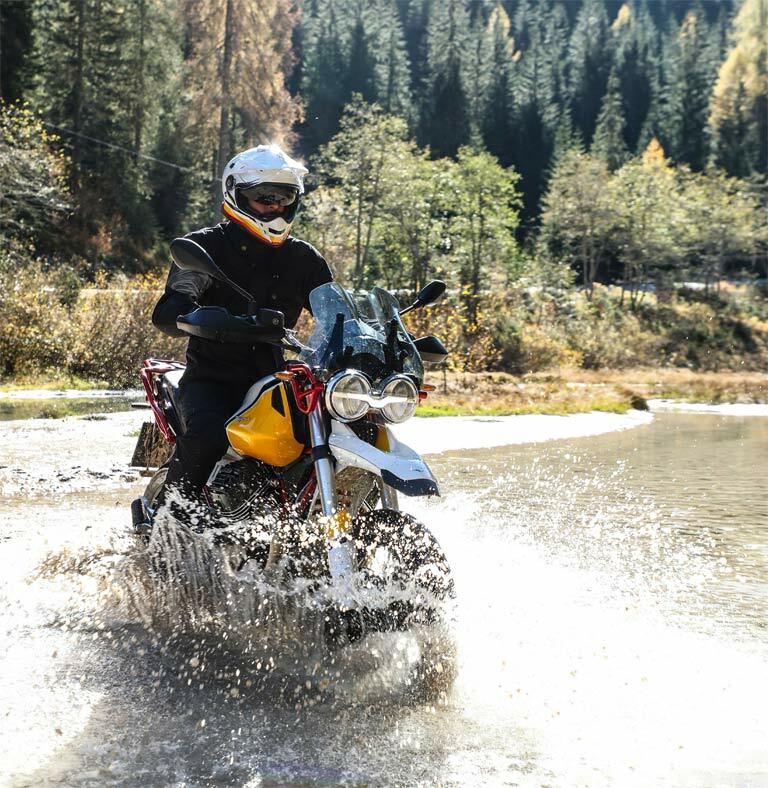 If you are considering performance-oriented ADVs like the KTM 790 Adventure or Tenere 700, you might want to look elsewhere. 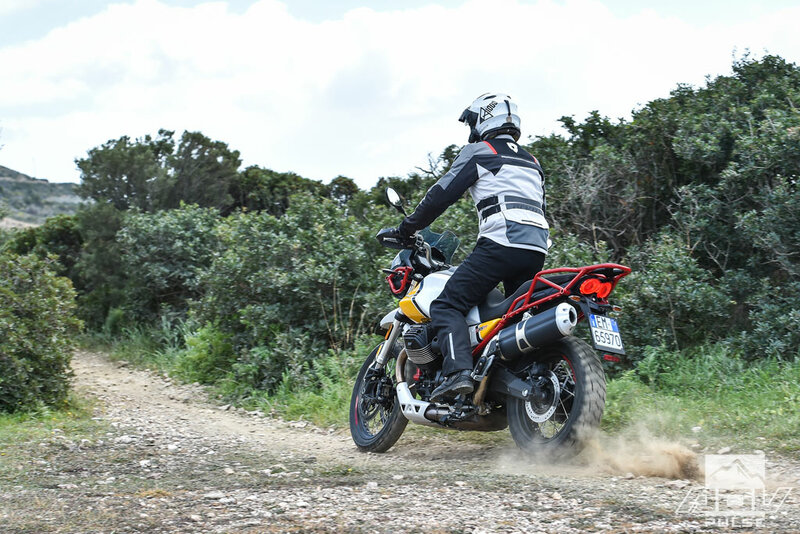 But if travel is on your agenda – with the occasional off-road excursion – and you’re smitten with something that looks a little different, but provides shaft-drive reliability and Italian V-twin sounds, then the V85 TT is a wonderful option. It sits in the middle of a rich and diverse showroom these days, and, in true Guzzi fashion, stands out from the crowd. 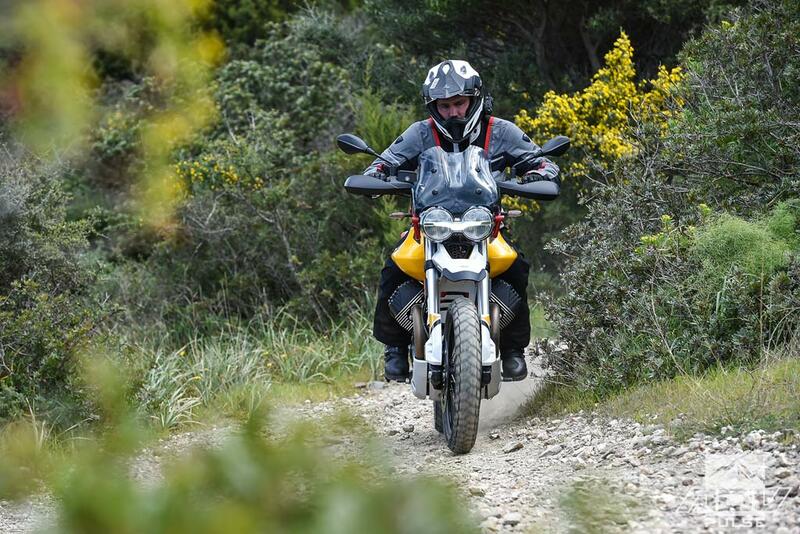 There will be two versions of the new Tutto Terreno available in the US, the V85 TT and V85 TT Adventure. As mentioned earlier, the latter of which will come equipped with Michelin Anakee tires, and full hard luggage system (top and side cases) as standard. The bike will be sold in the United States as a 2020 model, available starting in May/June of 2019, priced at $12,990 for the V85 TT Adventure, and $11,990 for the V85 TT, respectively. Justin W. Coffey is a freelance photojournalist and co-creator of WESTx1000, a multimedia company that creates unique content for the motorcycle community. After riding a desk for a few years, he traded weekly marketing meetings for a motorcycle. Since then, he has circumnavigated the United Kingdom on a Royal Enfield, hunted for haikyo aboard a dual-sport in Japan, crossed the United States on an Indian Scout – and then drag raced it, and is generally looking to get into a little trouble. He currently splits his time between Baja, Arizona and the Pacific Northwest.